This newsletter’s theme was supposed to be finding your place, inspired by Sarah’s move across the country. We likely would have shared something about the definition of “the good life” given by one of our heroes, Cheryl Broetje: living in the place you belong, with the people you love, doing the work that’s yours—on purpose. When it comes to political discussions, the advice to businesses sounds like the words of Hamilton’s fictionalized Aaron Burr: “Talk less. Smile more. Don’t let them know what you’re against or what you’re for.” I made a commitment after the election to being a better person and a better citizen and to making &yet a better company. I am spending this year seeking the answer to the question: “Who will &yet be for the next 10 years?” One thing I know I do not want us to be is silent. It’s been a hard week for anyone who believes in who the USA can be based on the bold, aspirational vision of a land where all people are equal, where immigrants are welcomed with open arms, where no one religion rules the land, where the government serves and answers to the people—a vision we’ve still not lived up to, but which we’ve seen take two steps forward and one step back for two-plus centuries. Just a few days into this presidency, this fear hasn’t proven unfounded. I have found myself so disturbed and emotionally raw by the state of our nation, I disabled all my social media accounts. Being inundated with an overwhelming flood of terrible news was making me feel ashamed, overwhelmed, and powerless. I needed to recover and focus on what I could do. Forty years later, it feels like we are moving in the opposite direction of this vision. Yet there is reason for hope. We live in a nation that holds some very idealistic values. We have never fully lived out those values and we have certainly never been perfect—far from it, in fact. We displaced a massive native population. We were founded by people who owned people. We’ve been led by people who slaughtered natives and created our own refugee crisis. We unjustly imprisoned people for their race. We’ve fought wars over wealth and resources and “our (comfortable) way of life.” But no matter what we’ve done, our commitment to our ideals has drawn us forward. 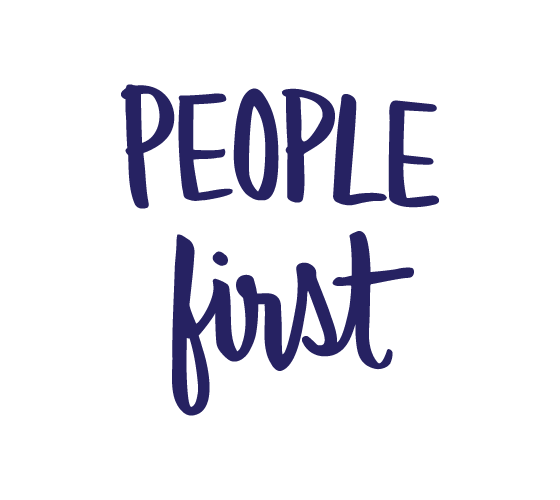 For us, this phrase usually is a statement about the importance of individual people being more valuable than ideas or profit or plans. 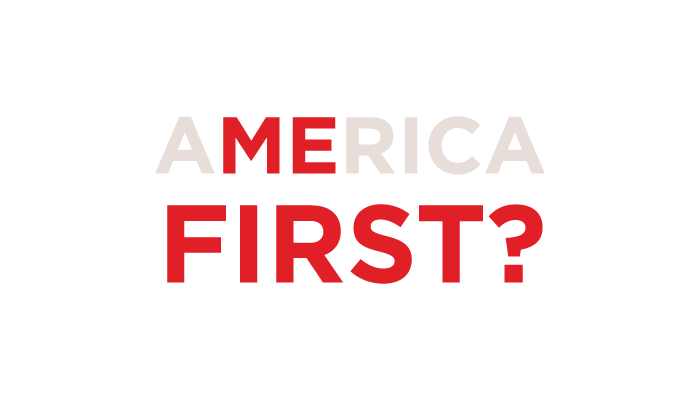 But since the inauguration, every time I have put on this sweatshirt, I have done so as a protest against the broken mentality of “America First.” I think we can do better than a small-minded, selfish view of the world that prioritizes one kind of people over another. It’s so easy to point fingers and assign blame in politics. Laying it all at the feet of our new president is a cop-out. I’m complicit, too. Our consumeristic view of politics means that we get to abdicate responsibility when someone is in power who we feel matches our worldview. The 10,000 refugees the Obama administration said they were going to let in is nearly as shameful, in some ways. We kept the crack of hope open wide enough to say we weren’t completely abandoning our values. It upset me deeply that we weren’t doing more, and I expressed that, but I’m embarrassed to say I moved on. We each look at photos of refugees and ache. The world should be better. Like you, we believe it’s possible. But probably also like you, we have found it so easy to feel powerless these days. And yet we are not powerless—not by a long shot. No one can stop us from making things better than they are right now. And resigning ourselves to powerlessness undermines the most fundamental truth that our government serves the people. The current administration has given us a wake-up call to how fully we’ve abdicated our power as citizens. The new president said in his inauguration speech his goal was to restore power to the American people. Ironically, he may be correct in that as the ultimate outcome. Our world needs tiny people like us, tiny companies like ours, and the people we are surrounded by to add our voices and our hands to leading our society. We need leaders who constantly make room for more leaders—not fewer. We need you. In the immortal words of Tina Turner, “we don’t need another hero.” No, our world needs entire armies of leaders. And we need to believe that’s not just enough—it’s the most powerful force on earth. It’s so easy to feel cowed by the sheer force of power, but Jenn pointed to this thread illustrating the many ways engaged people have already had an impact. We need to do exactly that—for each other. We need to encourage people that it matters that they stand. We need to stand with each other, stand up for each other, stand beside each other. We need each other’s help to believe our voice, our phone calls, and our small, repeated actions matter. We need to ask for each other’s help to remember to rest and take care of ourselves and our mental health, to save our strength for a long marathon. The world should be better. Like you, we believe it’s possible—together. P.S. We might have to order some more hoodies. ;) In fact—we are! 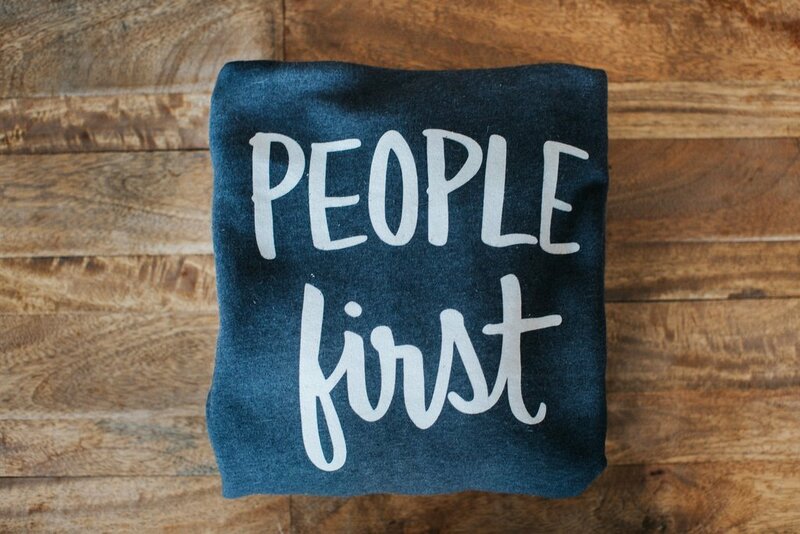 You can pre-order a super-soft “People first” hoodie here for $48 + shipping. We’re donating 100% of the profits to the ACLU—at least $15 from each hoodie).